Company Information ｜ DandeLion Animation Studio Inc.
We started from a small studio of 5 members. 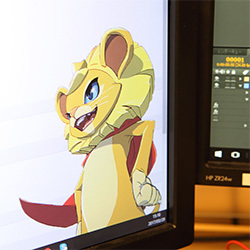 Through producing animations of different types, we’ve gained pretty much experience in this field and ten years later we have become a production studio with 80 staff that can afford TV and theatical series animation production. Compared with automated large scare plants, we are more like a small factory where gathers experienced "animation" craftsmen. Thus, there is a limit for production quantity and speed. Lucky that we have qualified teams that can make products with high quality. For next 10 years, we are thinking to make titles which show how DandeLion want to be. "A gift for all children"
This is our first and of course, the most important mission. Instead of pursuing only for fame or being unusual, we prefer to produce titles which can really make people feel touched with great empathy. Please keep an eye on this small animation "factory" located in Nerima, a suburb ward of Tokyo. We will keep spreading animation throughout the world. ・Planning, production, and distribution(sales) of digital animation and application software. ・Planning, production, and distribution of animation for feature film, TV, and social media. ・Practical use and distribution, license, protection of intellectual property rights. ・Planning, production, and distribution of promotional items and merchandizing. ・Ads and online shopping business using internet. ・All business related to above. 4 The representative of our company, Mr. Nishikawa, resigned from the TOEI Animation. Positioned as a CG animation planning and producing company, the Dandelion Animation Studio, LLC was founded with five members. 6 RoboDz Kazagumo Hen broadcast on the Toon Disney channel. We worked as the CG director & CG Production for the series. Joined the production of Oblivion Island -Haruka and the Magic Mirror-, a full CG film. 12 Film ONE PIECE FILM STRONG WORLD released. The virgin production as film CG director. 4 An office space expansion for our staff member increased to 15. Meanwhile, our business scaled to game, promotion, recreation related videos. 3 Film ONE PIECE 3D: Mugiwara Chase released. 8 Pretty Cure All Stars DX3D theatre released. An office space expansion for our staff member increased to 30 . 4 Film A Letter to Momo released. 6 Film BLOOD-C The Last Dark released. 7 Film Guskō Budori no Denki released. 3 A second studio was setup at the Shakujii Park area. 7 A debut at the 1st Production Expo. 1 47 todofuken dogs R, our first prime-contract production began broadcasting on a channel owned by the Nippon Television Network Corporation. 4 A third studio was setup at the Shakujii Park area and the staff member increased to 40. A feature article about our company was published in the CGWORLD 188 Vol., a monthly Japanese CG magazine. We also featured on the cover in that edtion. Haikyu!! began broadcasting on channels affiliated to Mainichi Broadcasting System and Tokyo Broadcasting System. 3 Computer Animation Unit founded. Staff member increased to 60. A promotion video utilizing computer animation technique produced for the Angry Birds Fights! . 4 An article, titled First feature: CG Animation 2015, introduced about our company was published in the CGWORLD 200 Vol..
5 Film Sarusuberi -Miss Hokusai- released. 7 Rights Business Unit founded. A debut at the 5th Character and Brand Licensing Trade Show. Mascot design for a Chinese music company based in Shanghai. 10 Film The Empire of Corpses released. 3 The representative of our company gave a speech at the Hong Kong International Film & TV Market. 4 Ran a booth as a representative of Japan at the China International Cartoon and Animation Festival being held in Hangzhou, a city located in east China. 7 The Morose Mononokean and Tsukiuta. THE ANIMATION began broadcasting on channels including; Tokyo Metropolitan Television. 9 Listed as a member of the Association of Japanese Animations. 10 All the three studios scattered at the Shakujii Park area were moved into one building at the nearby Ōizumi Gakuen area. 3 Robomasters：The Animated Series, our prime contract production, released. S-project, a global co-production, kicked off. 4 The 10th anniversary of our company. 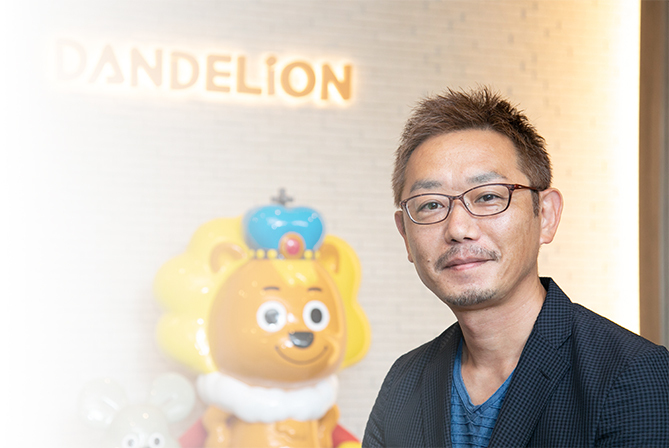 3 We changed our trade name to DandeLion Animation Studio Inc.
Our corporate name came from flower, dendelion. In French, "dandelion" has a meaning of "lion’s teeth(dent-de-lion)", also. Dandelion is the small flower which bloom partically anywhere, consisting one flower with bunch of flower petal. Even more, green leaves look like teeth of lion. Also, when blooming season finishes, puff will fly on the wind. It has vital energy, and can bloom flower wherever it’s seed lands. With an adult’s perspective, it is too small and not gorgeous flower, but as a child, it is a flower you see daily. DandeLion Animation Studio is production studio which make TV and theatical series CG animation which strongly bloom to children’s point of view. We have renewed our company logo for 10th year anniversary. Motif of the logo is our former logo, which was illustration of lion and our original character "Kenta". We created simple character logo which can be widespread and popular, as well as easy to read but playful.